The 5100HD hosts a dual laser platform. Two separate lasers are installed in the instrument, sharing a common optical path through the sample, enabling the measurement of two analytes simultaneously. This results in significant cost savings to our customers. Where the required concentrations of the analytes differ considerably such that different path lengths are required, two sample cells are used. 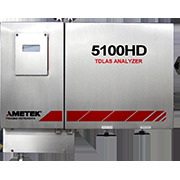 The 5100HD is also capable of dual stream analysis, and can measure any two combinations of water vapor, methane, hydrogen sulfide, carbon dioxide, and oxygen in process or flue gas. Designed to handle sample gases with high dew points, the 5100HD standard version has its sample cell heated to a maximum of 100°C. A version is also available for 150°C. A key feature of this analyzer is the use of sealed reference cells, which contain known amounts of analyte gases measured, for referencing the emission wavelengths of the lasers. The use of reference cells enables both the ability to line-lock the lasers and to continuously verify the optical system performance.